Welcome to the ATL LOVE Series! I've asked a handful of my favorite Atlanta bloggers to give us an-eats-and-treats tour of their favorite Atlanta area neighborhood over the next few weeks. Many thanks to the talented Natalie Kilgore, who's incredible hand draw illustrations really tie the series together. You can purchase her work in her etsy shop, Natty Michelle Paperie or follow her blog, Natty Michelle, for her insightful "free-lance ladies" series or peeks into her charming home. 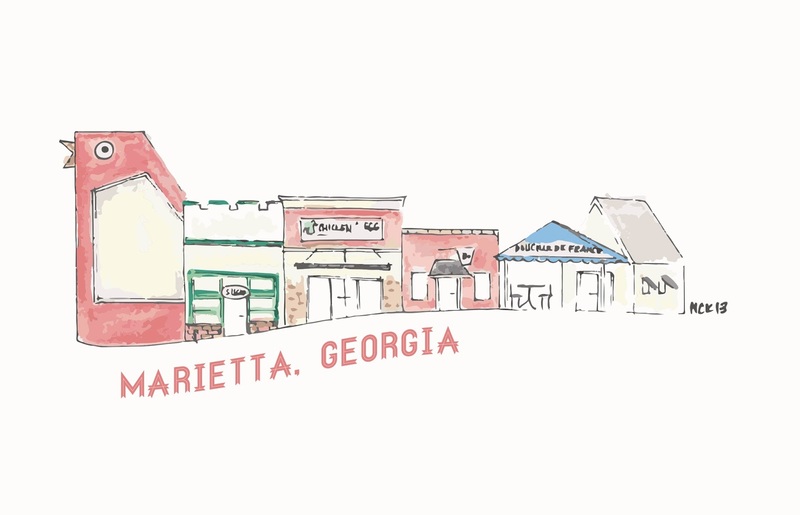 Today's ATL LOVE takes us right down the road from my house to Historic Marietta. Our tour guide is the lovely Lesley Graham who's blog is my go-to for uplifting, real life talk on mommy-life, blogging, and faith. Her post on prayers for little ones is a recent favorite! What do you love about your neighborhood? The oversized pecan trees, history, and Americana drew us to our current neighborhood. After experiencing a very "Hocus Pocus" halloween with some friends that lived in the 'hood we were sold! We also love that there are great schools, shops and restaurants, trails and Kennesaw Mountain within walking distance. We feel really blessed to be here. Favorite breakfast/brunch: All-time favorite is Douceur de France. In the cooler months, they have a fire going and I absolutely love their Quiche Lorraine. If I'm feeling extra splurgy I'll grab some macarons from the bakery on the way out. Favorite coffee stop: I'm loyal to Cool Beans unless I'm trying to get work done... I always run into friends there! Best date night bet: For our anniversary we went to Chicken and the Egg and they went above and beyond to make it special. At the top of our date night wish list? The Butcher The Baker. A husband and wife team recently opened this gem on the square, which I think gives us some culinary street cred. He's the butcher, she's the baker. Best meeting friends for drinks spot: For a wild night, Johnny Maccrackens (aka the crack). For a girls' night, I would go to The Butcher The Baker for their punch! Favorite dessert stop: Sugar Cakes makes this incredible mousse dessert called the Mirage. OMG. Best loved to-go dinner: We love the Pad see-u at Thaicoon. The perfect take-out for those long days where you don't feel like cooking. How's your local Farmer’s Market? : We have a really amazing farmer's market on saturdays and sundays. Bring cash, your bags, and start with a King of Pops popsicle. I love getting my flowers, vegetables, meat and more there. It's such a melting pot of people and food. There are also some of the most beautiful succulents and other plants for sale each week. I would recommend ditching the stroller for a carrier... much easier! Do you have a favorite local shop, vintage or flea market? : OK, I hesitate to share this... I love the Classy Flea! Love your comment Lora! My boss actually proposed to his wife on one of those benches. The Square is magic, isn't it? Thanks lady! I actually have your tour scheduled for Lucy's due date, hahah! I adore Marietta, one of my favorite places to visit. I wish I could set up camp at Douceur de France. I can't even tell you how happy I feel when I'm in that place. Love this!! Can't wait to read more..
Hope this helps you learn your new 'hood. This is so great! I never venture OTP, as they say, mainly because I don't know the best places to go. Will have to have a Marietta day soon!